The sixth season of Stargate SG-1 continues to deal with many of the ideas, plots and dramas that have been developed over the last five years - as well as being an excellent point to join the adventure as new member Jonas Quinn (Corin Nemec) joins the existing team (Richard Dean Anderson as Colonel Jack O'Neill, Amanda Tapping as Major Samantha Carter, Christopher Judge as Teal'c) and learns the ways of the SGC (Stargate Command). Near the end of Season Five, original SG-1 team-member Dr. Daniel Jackson (actor Michael Shanks) received a lethal dose of radiation when he defused a bomb on the planet of Kelowna - the world where Jonas was a scientist. At the point of death, Jackson was offered the chance to 'ascend' to another plane of existence and Quinn was banished to Earth by his leaders. As season six begins, the search for a replacement member commences and the team is initially reluctant to even accept Jonas as a candidate. 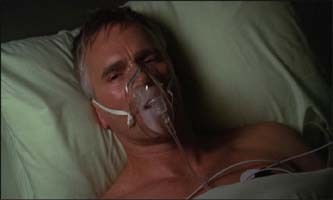 Early episodes of season six deal with his efforts to prove himself to everyone as well as setting up a new threat to Earth that SG-1 must uncover. 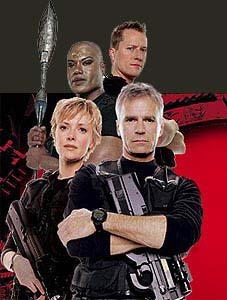 Brad Wright, the show's executive producer and prolific writer, said: "The two-parter Revelations (which opens the sixth season) is all about whether Jonas is going to be allowed to be on SG-1. All through episode three he's trying to prove himself and he's continuously trying to earn respect. We're not simply saying 'Daniel Jackson's gone, here's the new guy!' That would be stupid. We'll be honouring the character. That was the reason that I wanted Daniel to die in the next-to-last episode of season five. That way, we could see the grief that the team would experience. A huge part of Revelations was about that grief." "Brad phoned me and said 'So... welcome aboard... can you swim?'" 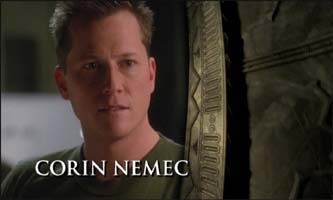 - Corin Nemec. "Once or twice a year I like to do things we've never done before," Wright explains." I don't know any show that's taken a whole portion of their set and submerged it. Our special effects team built a hydraulic rig as big as a set and then built a set within the steel frame, so it could be lowered. We heated the water to 98 degrees. The water comes up and up... it must have been terrifying, even though it was open at one side. Corin actually did a shot and held his breath while swimming and acting out the scene. While we were watching dailies, I tried to hold my breath as long. I barely made it sitting on the couch. It was over 140 seconds! But hey, that day was easy. The day when he had to be soaking wet all day... he had to be hosed down before every shot!" Executive producer Michael Greenberg explains that having Richard Dean Anderson (who previously starred as the hugely popular adventurer MacGyver) being involved behind-the-scenes as well as starring is a key reason for the show's impact. Season six will also have some familiar faces reappearing to cause trouble for SG-1. It will also have some renowned guest-stars. Watch out for Star Trek: TNG's John De Lancie reprising his role as Colonel Simmons in Prometheus; Enterprise's John Billingsley as a hapless scientist trying to save SG-1 in The Other Guys; The X-Files' Bruce Harwood in Frozen and Quantum Leap's Dean Stockwell as Jonas' mentor in Shadowplay. Fans of Daniel Jackson will also be pleased to know that Michael Shanks reprises the role in a special episode, Abyss, early in the season. SGC - Stargate Command, the military post set to deal with the use of the Stargate. Located in a top-level secret facility several hundred feet under the NORAD military base in Colorado. Goa'ld - An alien race of aliens that have conquered many worlds with their military might and their ability to take control of others' bodies by the insertion of their alien symbiote that can ultimately subdue the body and mind of the recipient. Though they have exploited the Stargate, they were not the ones who built them. The Tok'ra - An off-shoot of the Goa'uld who also exist as symbiotes. However they believe in sharing their existence rather than dominating. Though decimated in number, they continue to work against the Goa'uld. However, their methods have sometimes proven somewhat morally dubious as well. 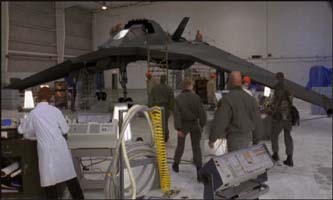 The Asgard - During their travels, SG1 discovered that many of the Norse legends were, in fact, based on events connected to an extraterrestrial race known as The Asgard. Their real appearance is akin to the traditional 'little grey men' but their stature belies their considerable power. Their representative 'Thor' has helped (and been helped by) SG-1 on a number of occasions. Replicators - A mechanical spider-like race whose reproductive ability and hunger for all metals has made them a menace to even The Asgard. The Ancients - Little is known about the race that appears to have built the network of portals that we refer to as Stargates. 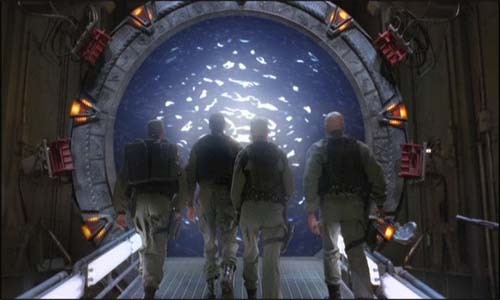 They existed millions of years ago and evidence suggests the race were on Earth at that time - though the Stargates were actually brought to Earth by the Goa'uld. Anubis - An alien, possibly a Goa'uld, who is acquiring a vast array of superior weaponry and is systematically wiping out his enemies and rivals. But from where is he gaining this crucial advantage. During season six, SG-1 will attempt to find the answer. With thanks to Darren at MGM press office. Season six of Stargate: SG-1 is being released on DVD (£19.99 each) and video (£12.99 each) from 31 March 2003.